How to explore Kalimantan on the cheap. If you are looking for the road less travelled, you’ll find it Indonesian Kalimantan: the bigger, wilder and much less travelled chunk of Borneo. What you can do here on a budget (with a bit of grit and determination) is outstanding and worth every hour in a madly swerving taxi, overstuffed bus or spine-compressing speedboat ferry. 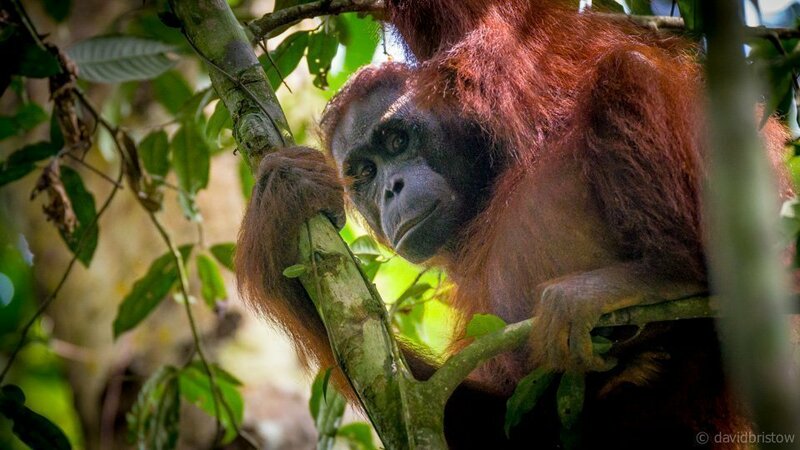 Want to trek in search of truly wild orangutans?….done! Want to swim in an inland lake swarming with stingless jellyfish?…..done! Want to drift with green sea turtles, dive with manta rays, or pin dive into the slender chasm of a rugged limestone sea cave?….done! Want to do it on a budget and without rubbing elbows with hundreds of other travellers?….read on because we just did. In three weeks of travel in Kalimantan we caught sight of less than 10 non-Indonesian tourists, and we had the most fun in Eastern Kalimantan, spotting orangutans in Kutai National Park and spending time under the sea off Maratua Atoll. We flew into Balikpapan from Denpasar, Bali. Balikpapan is Kalimantan’s most central arrival destination and one of two fly-in entry points offering visas on arrival. There are direct flights to Balikpapan from Singapore (Silk Air), Jakarta and other parts of Indonesia with Garuda and it’s budget carrier Citilink, Sriwijaya, and Lion Air and its budget option Wings Air. 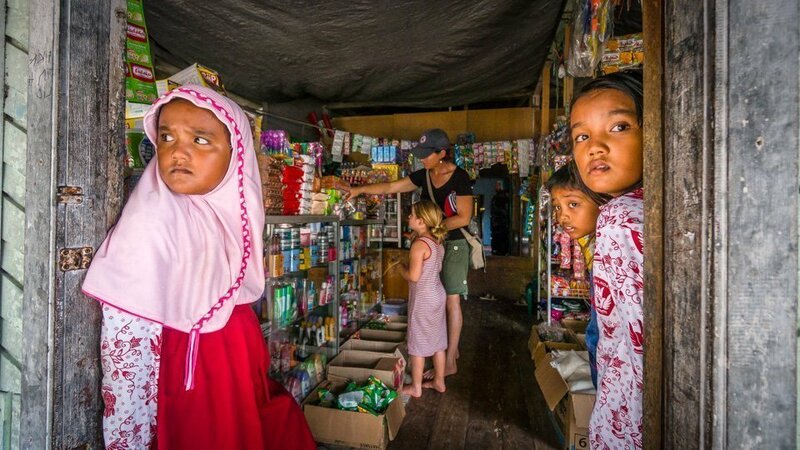 Distances between towns in Kalimantan can be pretty lengthy – 10 hours on a bus is not uncommon due to poor road conditions – but on the whole, bus travel is easy and cheap (eg. 55,000Rp/AUD$5.50 for a 4 hour ride from Samarinda to Sangatta). 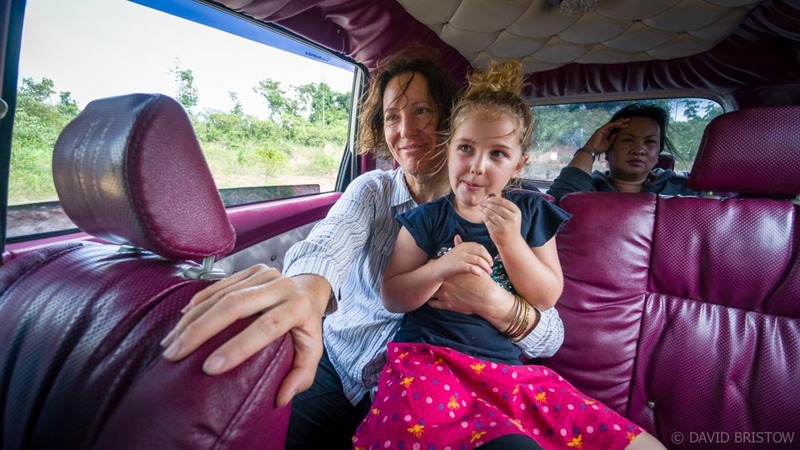 The exception is in far eastern Kalimantan on the rugged mountain route from Sangatta to Berau where a taxi cartel rules the roads and charges on average, around 350,00Rp per person (AUD$35) in a share taxi ride that took us eight terrifying hours. The only bus company we tracked down (www.bosbis.com) is cheaper, charging 199,900Rp (AUD$20), but the trip takes 18, probably less terrifying hours. Fast and furious or slow and painful…..tough choice! Grab car is cheap and convenient for quick trips between airports, hotels and bus stations (we paid 40,000Rp – 50,000Rp on average per ride), and a big plus is that the easy phone app alleviates the need for drivers to speak English. Internal flights in Kalimantan are very cheap. We flew direct from Berau to Balikpapan after our island trip for around AUD$42pp (overlanding by bus and car between the cities cost us AUD$60pp the week before). Hut accommodation: 200,000Rp per room (we were free to cook our own food). We booked most of our hotels online, used the occasional guidebook recommendation and paid between 120,000 and 250,000Rp (AUD$12-25) for double rooms, air con, most with attached bathroom and breakfast included. Solo travellers and those content with fans will find even cheaper deals. The most we paid for a room was on remote Maratua Island, where we opted for a breezy beachfront bungalow with views at Nouri Cottages (400,000Rp, breakfast and morning pastries included, free water, tea and coffee), but we could have stayed in a village penginapan for 250,000Rp per room. Using Agoda and Booking.com saved us quite a bit. One example….when searching for a stay in Pontianak I was quoted 350,000 over the phone for a double room (Lonely Planet had it at 477,600Rp, which put me off a bit), but when I booked it online, I ended up paying just 250,000Rp – ensuite, air-con, Discovery Channel and a huge buffet breakfast included!! The cheapest part about travelling in Kalimantan is that you won’t waste a whole lot of money on beer. In budget circles is doesn’t really exist, although in our hotel in Pontianak we did celebrate with a big Bintang for the extravagant price of just AUD$5.50 a bottle. Food is very, very cheap. We mostly ate in small warung – streetside cafes – and paid 10,000 – 20,000Rp (AUD$1-2) for noodles, fried rice or nasi campur (a selection of vegetable, chicken and egg dishes scooped on top of rice, charged per scoop). Rich, thick hot and iced coffees and chilled lemon tea set us back about 5000Rp a glass. Water was usually provided for free in our guesthouses and hotels so we simply refilled our own bottles, but when we had to buy it, the price was 3,000-5,000 for 1.5 litres. Guidebooks make a big deal about needing Bahasa Indonesia to negotiate your way around Kalimantan. It’s true that far, far less English is spoken in remote areas of Kalimantan than say, Kuching and Kota Kinabalu across the Borean border. Sometimes, getting where you want to go takes patience and the help of Google Translate, but we always got where we wanted to go, eventually! We found locals to be enormously patient and good natured when we tried out our strangled Bahasa to order vegetarian food; laughter and saying ‘terima kasi’ (thank you) a lot, helps! Learn your numbers and how to say “how much is it?….Berapa harganya?” and you are halfway there. One tip on getting to Maratua Island: from Berau we tried unsuccessfully to book on the local ferry because the ferry driver I spoke to on the phone didn’t speak English. Instead, we ended up paying 300,000Rp for a taxi to the port at Tanjung Batu (2 hours) and 1,000,000Rp for a speedboat charter to Maratua (1.75 hours). On the return trip I asked the local ferry captain (in Bahasa) the price direct to Berau and ended up paying just 200,000 per person for the three hour-long ride (my child travelled for free) – a huge saving of AUD$90, proving that a little Bahasa will save you big bucks! If you are plotting your adventure right now, feel free to ask your questions, or add comments below. So happy to get to know your family. Our daughter is 4 years old, we would like to bring her to see the world. Thanks for all the good tips. Four years is a wonderful age and the sooner you start to travel with your kids, the more fun you will all have on your adventures! We are planning to travel with uor kids to Kalimantan next August. I found the info in your blog really interesting. Just a question, I can see you stayed in Nouri cottages in Maratua, what are Nouri cottages like? Did you have a good time there? Hi Fernando, the cottages themselves are lovely, right on the beach, air-con, cold water shower, small deck out the front. Breakfast is included, there’s tea, coffee and water provided all day and the staff are very friendly. You can order dinner too. We booked a double room (large enough for our trio) but I’m not sure how you might bed down your family. Regardless, it will be an affordable option. Send the owner Rivi an email – he is prompt and speaks great English ([email protected] I will have a full feature on Maratua on wildtravelstory.com this week so make sure you subscribe to get the link. You will LOVE Maratua – easily the best Indonesian island I have ever encountered! Thanks a lot for your answer. We are looking forward to our visit to Maratua. Just another question, we are planning to stay 4 nights in Derawan and 5 nights in Maratua. Do you think it is better to spend 9 nights in Maratua and skip Derawan? Hi Fernando, we only called into Derawan briefly at the end of our trip but it looked incredibly crowded, being such a small island. If you are keen to mix with other travellers and enjoy more of a night scene, Derawan offers that (i.e. you can get a beer there! ), and it’s only one hour from the coast. We had our heads underwater at Maratua and loved the isolation. If I went again I would go straight to Maratua. There’s not much to do in the evenings, other than enjoy a home-cooked meal in the nearby village, or swing in a hammock with a book, but we loved it. Let us know how your adventure goes! I will be in Kalimatan at the end of August this year, and we plan on having 6 days there. Do you think we can spend a couple days at the Kutai park and then head up north? We were thinking of flyin ginto Balikpapan and then fly back to Bali from Berau. I think that’s a great itinerary. We spent two nights at Kutai with walks over two days, then hired a car to drive us to Berau. If you left the national park early enough, you could reach Berau and maybe make it to Maratua (sea conditions depending) in one long day. Otherwise, you’d still have a few great nights on Maratua before flying out of Berau, which is a well connected airport. Have a great trip, we will have a full article on Maratua Island up on the website soon so be sure to subscribe to get the notification – everything you’ll need to know! I am going to Borneo (Indonesian and Malaysian sides) in October/November this year and I was wondering if 8 days were enough to do Loksado/Banjamarsin and Mahakan river from Balikpapan? I unfortunately don’t have more time in the Indonesian side and I am not one that liked to be rushed so do you think it might be better to just focus on one of those two ? If yes, which one of the two would you recommend? I think 8 days would be a good amount of time to devote to Loksado and the Mahakan River. If you have an extra couple of days, consider hiring a car (or taking the bus) to Sangatta and spending a day in Kutai National Park, trekking in search of wild organutans. It was without a doubt, the best wildlife experience we’ve had in Asia. The trip is very easy to organise and there is lots of information on our website. Feel free to ask any questions you may have once you hit the ground over there. You will LOVE it!!!! Hi there, this is a really helpful article as it’s quite difficult to get info on this so thanks! I’m looking to do a 2D/1N tour in Kutai, can you give me a bit more info of how to get to Kutai from Samarinda? Can I just grab a bus or a driver in the morning? And how long is the journey? I think from Balikpapan airport I can get a bus either to Samarinda or Bontang, do you think going straight to Bontang would be better? You are right, we had to gather all our information on the ground as no one is writing about Kutai. There’s information in the “Essentials” section at the base of the article that tells how we organised the trip. We flew into Balikpapan, took the bus to Samarinda (two hours) but you could also book a driver through any hotel or use the Grabcar app. We stayed a night in Samarinda (lovely spot) and then took another bus to Sangatta (4 hours) where ranger Pak Supiani picked us up (just call him on the number in the article to arrange everything). Bontang is another part of the park but we did not visit it.